There are so many components in cupcakes that it seems they can be made in so many different ways and varieties. One way that you can really make them interesting is with the different types of stuffings. You can use your regular cupcake batter which you will then fill your muffin tins a quarter full, gently place layers of marzipan on top of these and finally fill the rest of the tins with the batter mix. One of the great things about cupcakes is that unless you have been told, you don’t know for sure what you are going to find at the centre. There are all kinds of fillings like jams and jellies and even pieces of candy. Watch to see if you need to adjust your cupcake batter to accommodate for this. If you are not into baking your own cupcakes then you will still be able to find a great selection of filled cupcakes at your local bakery. Many of them have their own personalized versions. Another favourite is to take the baked and cooled cupcakes and cut the tops of them. 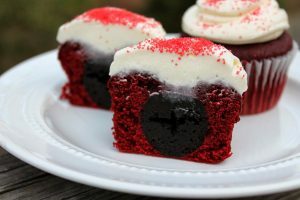 Then hollow out a portion of the center of the cupcake. Now fill it with your favorite filling and put the top back on using some of the icing to hold it back on. Make sure you know how to properly store your cupcakes depending on what they have been filled with. This is especially important if the filling is some type of cream. Also, make sure that you do not overfill your cupcakes. If you are ordering your cupcakes from a bakery and want them filled with something special, then you will need to make this known when you order them. Make sure they are going to be consumed relatively quickly as stuffed cupcakes tend to go soggy, if kept too long.